Abraham started growing a beard just like every other boy turning into a man. His Papa taught him to shave just like his own Papa taught him. Every few days the razor came out of its leather pouch ready to do its job. In winter, when he got older, he let it grow out to keep his face warm in those biting Wisconsin winters. It didn’t matter if he had an outside job that year or not, even ten minutes outside putting groceries in his car was too much cold for him. Abraham, never “Abe”, had thought about moving to warmer climes many times, but that all changed when he became a monk. His first vow was of stability – to stay right where he was and make the world right around him better instead of traveling to some far-off place where they might not speak his language or even have flush toilets. He figured that the good Lord put him here for a reason, so here was where he’d stay. His second vow was to not cut any of his hair. 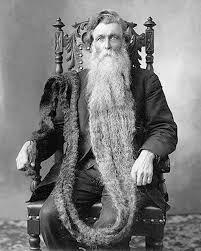 Every day he washed and combed and oiled his beard and the hair in his head. This went fine until it all grew so long that he started sitting on it, or it got caught in dresser drawers. Then he started wrapping his hair up in a piece of linen, wound about and about until it was up out of the way. This worked for about a year. After that, he started tucking his beard into his shirt pocket, just like it was a pocket watch or a handkerchief. A decade later he took to putting it over his shoulder. Sometimes he’d wear an old military jacket with a shoulder strap. It was never anything so fancy as an epaulette, just a plain piece of cloth the same color as the jacket with a button to open and close it. While the button was helpful, it had caused a snag a time or two. The only odd thing was that Abraham was a monastery of one. Nobody else even knew he was a monk. He never dropped so much as a hint to his friends, who never would’ve suspected and wouldn’t have believed him if he had said anything. The day after his parents died he made his vows and never swerved from them. His third vow was to not speak about his spirituality unless he was asked. He agreed with the Lord that it was rude to brag about your holy walk, yet he also was careful not to appear as if he was denying the Lord either. It was a tight spot to be in. He figured he could tell people about his faith only if he was asked. That to him was a sign from the Lord. It was only when the traveling photographer asked him about his beard that he told, and he was the first to ask in 20 years. Sure, people wondered about his long hair and his refusal to travel even to the next town over, but they never asked him about it. They thought that was rude to ask. That didn’t prevent them from talking amongst themselves, however. The vow of stability was a tough one. Abraham had a bear of a time getting good shoes until the Payless store opened up a franchise just three streets away from his house. His vow to stay in his town was not up for alteration. For nearly eight years he had to wear the same pair of brown Oxfords because there was no place to buy new ones – and he certainly wasn’t going to buy them used. Used shirts and pants, certainly, but shoes? Never. No amount of Lysol could convince him they were clean enough. Even a monk has standards. The city of Two Creeks, Wisconsin had never seen a traveling photographer until that bitterly cold Thursday in May. Even if it hadn’t been so unusual for a photographer to appear almost overnight like a ring of mushrooms in the lawn, the cold snap would certainly have fixed the date in the minds of most of the nearly 450 people who lived there. Abraham turned around and looked at the man for a full minute before he answered. The photographer thought that maybe he was deaf, so he began his spiel again, but Abraham held up a hand to stop him. He was trying to figure out how to answer. His first problem was being hailed as “young man” since it was as clear as the silvery hairs on his head that he was far from being a spring chicken. Either the man was trying to butter him up or he was crazy. Neither one was good. “Why would you want to do something like that?” Abraham asked. He liked a deal, same as the next person, but he knew that “free” meant that there was a cost down the line somewhere. Nothing was ever really free, it just meant that you didn’t pay for it. Someone did. That meant you were beholden, and beholden was a string. He was opposed to strings. They ended up being nooses more often than not. And Abraham told him his story, all of it. Truth for truth, since he asked. Told him how he was a born confessor. People all over, those he knew and those he just met, told him nothing but the truth all the live long day. They felt relieved, all their guilt and shame off their chests. It started early on, as soon as he entered kindergarten. The other children just knew and came up to him. The teachers did too. It was overwhelming at first but he got used to it – well, as much as you can get used to people telling you all their secrets. Abraham thought this was normal, because it was normal to him. He had nothing to compare it to so he never told his parents about it. Funny thing was though, it was like a superpower. The fact that people told him all their business meant that he could handle it. It was like God gave him extra strength to be able to carry all those secrets. Maybe he didn’t even carry them. Maybe it was more like he was a telephone booth, and people used him to speak to God. He figured that some people chose to dial direct, praying in their own words on their own, but then there were some who needed a person to be with them when they did it. Something about praying in an empty room made them feel like they were talking to themselves, and that bordered on crazy. Abraham was just the sort of safe person they needed. After he told his story to the photographer, Abraham moved the very next day and left no forwarding address. It wouldn’t do to let it get out that this is who he was. Soon everybody would be beating a path to his door to unburden themselves. It was enough that people did it anyway, without even knowing that was what they were doing. It seemed honest, even pure, that way. This knowledge would turn that inside out. He might even have to set up office hours, maybe even go so far as to charge. Just the shock of thinking about the mess that would start as soon as word got out decided his mind for him. So he shaved his beard and his head so nobody could identify him, and he started walking west, taking nothing with him. His neighbors didn’t suspect a thing because he walked all the time and he never caused a fuss. It was a week later that the word of his abilities got to them, and by then his mailbox was full and the grass needed cutting. By then he had found a new life for himself and started to regrow his hair again. This entry was posted in Stories and tagged black and white stories, confessors, monk, truth telling, vow of stability. Bookmark the permalink.